A modern decor Wi-Fi access and a location near shopping and entertainment are highlights of the pet-friendly Red Roof Inn Allentown Airport. Each of the hotel's 115 rooms on three floors features contemporary furniture desks free local calls granite vanities and safes; some rooms include microwaves and refrigerators. Wi-Fi keeps you in the loop and the business center makes a convenient office when you're on the road. Your four-legged friends are welcome and parking is free. One mile from Lehigh Valley International Airport the Red Roof is just off Route 22. Take the family out to the ball game at Coca-Cola Park one-and-a-half miles away or shop until you drop at Lehigh Valley Mall five minutes west. Downtown attractions including the Liberty Bell Shrine Allentown Art Museum and America on Wheels Museum are five miles southwest. Head 15 minutes west for the rides and slides at Dorney Park and Wildwater Kingdom. Lehigh University is 15 minutes southeast. Get ready for a "very peaceful and calm" stay say our guests. "Privacy and comfort" are the name of the game at this "fantastically" located Red Roof Inn. Our guests enjoy complimentary parking on-site dining and a convenient location at the Days Inn East Stroudsburg. The two-story Days Inn provides 105 motel-style rooms all with coffeemakers work desks and complimentary newspapers. High-speed internet access is available. For lunch or dinner don't miss the in-house Mexican restaurant. As for recreation there's a game room and exercise room. Other amenities include laundry facilities and plenty of parking. Non-smoking rooms are available. The Days Inn is located off I-80 in the Poconos 42 miles from Allentown and five miles from downtown Stroudsburg. East Stroudsburg University of Pennsylvania is right down the street and Pocono Medical Center is three miles from the hotel. Families ski at Shawnee Mountain five miles away or hike the trails at Bushkill Falls 12 miles away. The Mount Airy Casino is a 16-mile drive. Lehigh Valley International Airport is 39 miles from the hotel. Wilkes-Barre/Scranton International Airport is 53 miles away. A "convenient" restaurant "courteous" staff and location that's "close to the highway" are highlights for Our guests at the Days Inn East Stroudsburg. Easy interstate access and free internet add to the value for our guests at the non-smoking Holiday Inn Express & Suites Allentown West. Each of the 52 rooms including 25 suites at the low-rise hotel has cable HDTVs a microwave a mini-fridge and a sofa bed. The property has a business center an exercise gym and an indoor pool. The entire property is non-smoking. The hotel offers easy access to both I-78 and I-476 and it's three miles from Dorney Park and Wildwater Kingdom. Allentown Rose Gardens are four miles away. Allentown Art Museum is eight miles from the property and the links at Bethlehem Golf Course are 12 miles away. Travel 18 miles to Lost River Caverns and Lehigh University. Lehigh Valley International Airport is 10 miles away and Philadelphia International Airport is 64 miles away. "Nice rooms" and a "helpful staff" greet our guests at the Holiday Inn Express & Suites Allentown West. The Days Inn Tannersville offers complimentary parking and free Wi-Fi to our guests who want to be close to all the Poconos has to offer. The two-story Days Inn offers mountain views and 72 rooms equipped with amenities like complimentary Wi-Fi microwaves and refrigerators. Parking is on the house. The Days Inn is located off I-80 west of Tannersville. If you're in search of the area's best bargain shopping Crossings Premium Outlets is less than a mile from the property. Skiers can go just four miles to Camelback Mountain Resort and Mount Airy Casino is about a six-mile trip. Lehigh Valley International Airport is 37 miles south and Wilkes-Barre/Scranton International Airport is 44 miles northwest. our guests drink in the "great mountain views" at the Days Inn Tannersville which features a "very pleasant" staff a "great" price and a location central to all the area attractions. A quick trip from the airport the Super 8 Allentown is convenient for on-the-go travelers and includes freebies like buffet breakfasts. Spread over two floors the Super 8 Allentown has 49 rooms with up-to-date amenities like TVs with premium cable channels. Microwaves and mini-fridges are around for when you need a midnight snack. Served in the dining area the buffet breakfast includes favorites like baked goods fruit juices and piping-hot coffee. For other meals there are fast-food eateries within a short drive. Close to Route 22 the Super 8 has speedy access to the highway. The hotel is less than a mile from Coca-Cola Park home field of the Ironpigs baseball team. Dorney Park a favorite with kids is 10 miles southwest. Lehigh Valley International Airport is two miles north. Whether you're driving or flying the affordable Super 8 Allentown gets you on your way in no time. Free evening receptions an indoor pool and fully equipped kitchenettes help our guests feel at home at the non-smoking Staybridge Suites East Stroudsburg-Poconos. The four-story Staybridge Suites provides 79 suites with fully equipped kitchens premium cable TV and DVD and CD players. Wi-Fi access is available. Enjoy the evening receptions Tuesday-Thursday and stock up on necessities at the 24-hour lobby market. Cool off in the indoor pool after working up a sweat in the 24-hour fitness room. Other amenities include a business center with copy and fax services a laundry facility a patio with a barbecue grill and free parking. Pets are allowed for a fee. Located one mile from I-80 Staybridge Suites is less than an hour northeast of Allentown. Area schools include Lehigh University 50 minutes away and East Stroudsburg University of Pennsylvania two miles away. Outdoor activities abound in the nearby Poconos and the state forests in the Delaware Water Gap area and hikers can trek part of the Appalachian Trail three miles from the hotel. Crossings Premium Outlets are 20 minutes west. Drive 25 minutes to Camelback Resort to ski in winter and splash at the water park in summer. Wilkes-Barre/Scranton International Airport is 55 miles from the property. our guests say the Staybridge Suites offers "comfortable" rooms with "amazing" kitchenettes in a "convenient" location only one mile from I-80. Free Wi-Fi and breakfast flat-panel TVs and a sweet spot near downtown sites and the river add to the budget-friendly perks at the Days Inn Easton. The four-story Days Inn Easton offers 86 rooms featuring mini-fridges microwaves coffeemakers and flat-panel HDTVs and non-smoking rooms are available. Guests can start the day with a free continental breakfast or a workout in the fitness room. On-site business amenities include free Wi-Fi and copy facilities. On-site parking is free. The Days Inn is located in downtown Easton one block north of the Lehigh River and less than two miles from I-78. The Crayola Experience pleases kids of all ages about four blocks away while top shows take the stage at the State Theatre Center for the Arts a half-mile away. Guests are less than a mile from Lafayette College and 12 miles from adventures within the Lost River Caverns. The hotel is 15 miles from Lehigh Valley International Airport. our guests appreciate being with walking distance of restaurants and adore the welcome breakfast choices at the Days Inn Easton. An extended-stay hotel with full kitchens and free Wi-Fi the Extended Stay America - Allentown - Bethlehem gives guests plenty of convenience at affordable rates. The three-story property has 104 rooms designed for guests needing additional amenities to make long-term stays easy and comfortable. Rooms include kitchens equipped with stovetops refrigerators and microwaves plus pots pans and dinnerware. TVs have premium cable and Wi-Fi is free. Guests have access to on-site laundry facilities. The hotel's front desk is open from 7 a.m. to 11 p.m. A security guard is on the premises to assist with late-night arrivals. Parking is free. Please note that this extended-stay facility provides full housekeeping service on a weekly not daily basis. The hotel is four miles from Lehigh Valley College and St. Luke's Hospital. It's six miles from the Sands Casino. It's 20 minutes by car from the Crayola Factory in nearby Easton and from Dorney Park & Wildwater Kingdom in Allentown. Blue Mountain skiing and snowboarding are 30 minutes away. Lehigh Valley International Airport is less than two miles away. our guests say "the value is excellent" at the Extended Stay America - Allentown - Bethlehem with its rooms with full kitchens and free Wi-Fi and its handy "close-to-airport" location. Get to the airport with the free shuttle; free Wi-Fi and buffet breakfasts are other amazing amenities at the Wingate by Wyndham one of Allentown's most popular hotels among our guests. The four-story Wingate has an open and airy lobby. In fact spaciousness is one of the hallmarks of this hotel which features oversized rooms. There's free Wi-Fi in all 105 of them. Also included are docks for mp3 players and flat-panel TVs with premium cable channels. Laptop-size safes are handy as are microwaves refrigerators and coffeemakers with gourmet beans. Large desks stand by for when you have last-minute paperwork. Head down to the dining area just off the lobby and help yourself to the hot and hearty buffet breakfast. If you'd like a bit of exercise after that swim laps in the heated indoor pool or work up a sweat on the cardio machines in the gym. In the evening there's a manager's reception Mondays through Wednesdays except in summer. Lehigh Valley International Airport is about 12 miles northeast of the Wingate; you can get there quickly via the hotel's free weekday shuttle. If you need to keep the kids occupied Dorney Park is a mile away and the Da Vinci Science Center is a little more than two miles away. Lehigh Valley Zoo is 12 miles north. The breakfast is "early and well-stocked" at the Wingate by Wyndham. our guests say that they love the "convenient location." Comfortable rooms with free Wi-Fi micro-fridges and flat-panel TVs plus a hearty complimentary breakfast contribute to a terrific stay at the highly rated Holiday Inn Express Hotel & Suites Bethlehem. The four-story hotel provides 80 rooms featuring deluxe bedding with triple-sheeting and a choice of pillows. Rooms are equipped with mini-fridges and microwaves handy for your snacks and doggie-bag leftovers. Catch your favorite program on 32-inch flat-panel TVs with premium cable and pay-per-view movies or surf the web with the complimentary Wi-Fi. Don't miss the free breakfast buffet where you'll have lots to choose from including a rotating menu of eggs bacon biscuits and fruit as well as fresh-from-the-oven gooey-and-good cinnamon rolls. And since there's an exercise room on the premises you can give it a try. If you'd prefer to make a splash in the heated indoor pool and hot tub the choice is entirely yours. Additional hotel amenities include a business center and a coin laundry. The hotel is one mile from downtown Allentown and the Stabler Arena. It's two miles to the Lost River Caverns and three miles to Musikfest Christkindlmart and the ArtsQuest Center at the Steel Stacks. Dorney Park & Wildwater Kingdom is 13 miles from the hotel; it's 20 miles to Blue Mountain. Lehigh Valley International Airport is 10 miles away. Comfortable rooms with flat-panel TVs and free Wi-Fi plus an indoor heated pool and hot tub are yours to enjoy at the top-rated Holiday Inn Hotel & Suites Bethlehem. Guests are sweet on the free Wi-Fi and breakfast in-room kitchens and variety of exciting nearby sites when staying at the non-smoking TownePlace Suites by Marriott Bethlehem Easton. 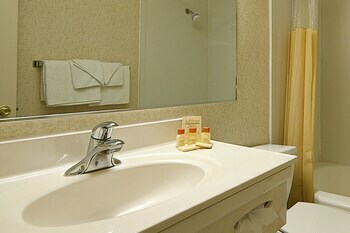 All 86 rooms at the four-story TownePlace Suites feature full kitchens free Wi-Fi flat-panel TVs and iPod docks. Get a hearty start to your day with a workout in the fitness room or a dip in the indoor pool then feast on treats from the complimentary breakfast buffet. After getting work done in the business center guests can relax with a soak in the hot tub. Coin-operated laundry facilities are available. Pets are welcome for an additional fee. On-site parking is complimentary. Situated off Highway 33 the TownePlace Suites lies five miles northwest of downtown Easton and the Crayola Factory Discovery Center. Wine enthusiasts are less than 20 minutes from Amore Vineyards and Winery and a 35-minute drive from Big Creek Vineyard. The hotel is also a 10-minute swing from Green Pond Golf Course and 20 minutes from Sands Casino. Lehigh Valley International Airport is 13 miles from the hotel. our guests praise the TownePlace Suites by Marriott Bethlehem Easton for in-room amenities that go "above and beyond" — like fully equipped kitchens — plus indoor swimming and an overall "great value." Budget-minded our guests stretch their travel dollars at the Best Western Plus Poconos Hotel with free full buffet an indoor pool and high-speed internet access. The 90 rooms at the three-floor property have microwaves mini-fridges and free Wi-Fi access and many also have fireplaces. Refresh yourself in the heated indoor pool and enjoy the complimentary full breakfast. Parking is free. The hotel is less than a mile from Tannersville and a short drive from I-80. About a half-mile away is Crossings Factory Outlets a haven for shoppers. Camelback Mountain Resort one of the area's top ski destinations is a four-mile trip and the slot machines at Mount Airy Casino are six miles from the hotel. Lehigh Valley International Airport is 37 miles south and Wilkes-Barre/Scranton International Airport is 44 miles northwest. our guests enjoy the "quiet" atmosphere at Best Western Plus Poconos Hotel as well as the "nice view" and "friendly" staff.